I thought the magnet was a super cute idea, the boys, especially my little one, LOVES magnets for the fridge! The Borghese Serum just isn’t for me though as it’s not AS intense as my Peter Thomas Roth viz-1000 75% hyaluronic acid complex! However I think this would be perfect for my twin sister! I was sad to see yet ANOTHER perfume sample as I have about 8 of these little teeny vials rolling around in my vanity right now. The scent itself is nice but the vials are just so… annoying to use that I end up just tossing them for the most part. I was SOO thrilled to get a Stila Eyeliner because I love the formula, its creamy, easy to blend, and has great pigmentation. This peacock blue shade is super lovely too! I’m torn on the Jouer body butter, generally I do not use an all over lotion most days and when I DO it’s usually the Lush Helping Hands. I think this will become a purse staple! The Larabar was an epic fail. I tried to pawn it off on my boys and they gagged and tossed it back at me. All I got from my oldest son is that “there is something WRONG with THAT!”. I did like they included an extra but I wish it wasn’t a FOOD item as I would like Birchbox to focus more on BEAUTY products rather than LIFESTYLE products. Overall I do think this box is MUCH better than last month’s and hope they continue to improve through out 2012! I like it overall, I just can’t handle anymore perfume vials LOL! I agree! I’m already super curious about what February’s box will be! Ohh, I’m interested to see how the Borghese works for your sister. :) I was hoping for a product like that, but oh well. I tried the Stila liner today and it really was very creamy. Really pleased! I’ll probably give it to her this upcoming Thursday and will have her let me know how it works for her! I am Sari’s test bunny for a variety of different things. I’ve heard mixed reviews about the BirchBox, which made me hesitant to try it when it was still available. It’s sold out now, but I don’t know if I want to subscribe or not. However, I see very nice products this month compared to previous months. I think maybe BirchBox is improving for the year. Wow, I’ve been on Birchbox since almost the start, never knew they sold out LOL! I haven’t fully formed an opinion yet simply because I have about 7 months of birchbox and only one with MyGlam. I think I’ll have a better opinion in March lol! Oh I would love the Lara bar! Being on a very limited diet due to health problems, this is one of the very few “health bars” I can eat. Some of them taste better than others, but when there’s not much else to eat in the house, I’m all over these. The peanut butter ones are much better. I love the peacock blue. These Birchboxes look really fun ! I’m not big on any kind of “bar” but that’s because I’m picky LOL! I think my husband likes them but the kids totally didn’t! The eyeliner is SUPER pretty! Hehe, it’s interesting- I was most excited to see the larabar & perfume in your picture. You should look for someone who orders something like this, then trade each month the things you’re not interested in! That is a cool idea! Right now I give the products to my sister if I don’t like them or need them LOL. I am late on this post, but whatevs! 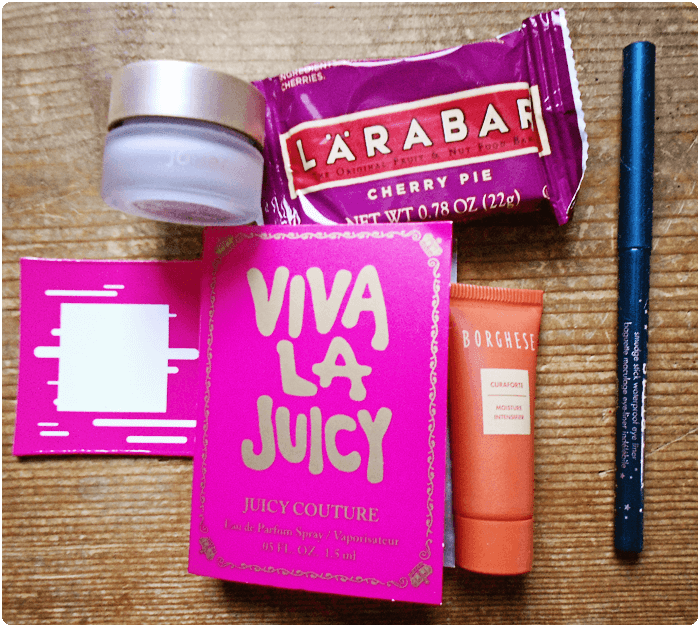 I received the same Birchbox, just with a different flavor larabar (which was SUPER freakin’ sweet – I couldn’t finish it). I kind of love perfume samples (I have a lot… one of the many things I collect, I suppose). I like to put them in my purse because they’re convenient. For me, the little vials drive me crazy! They either leak, break, or I get the same one over and over. I was super thrilled about the Stila eyeliner though, really curious what February’s box will have! The Birchbox extra items that I’ve gotten have been below-average at best (coasters in one box, Vitamin C packet in another), but I think the Larabar is a good one. I don’t mind that they send us extras, because it’s another item to try and the extra lifestyle items never take the place of your beauty samples.